An incredible organization that is both a working farm and a school for young farmers. 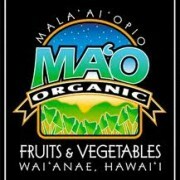 It grows organic veggies, fruits, herbs as well as farmers and community leaders. “Our community of Wai‘anae is located on the west side of the island of O‘ahu and consists of six major ahupua‘a (ancient land divisions). In ancient times, Wai‘anae was a self-sufficient region that produced adequate amounts of food for its people while managing its land and water resources sustainably. Wai‘anae’s isolated and rural geographic location mirrors the considerable political, economic, social, and cultural barriers facing our ‘ohana (families), especially for youth. Over the years, Wai‘anae residents have witnessed the gradual overdevelopment of scarce resources such as land and water, the negatives of urbanization, and the resulting disconnection of native Hawaiian ‘opio (youth) and their families from the ‘aina (land) that had once nurtured a strong and cohesive culture. Wai‘anae youth struggle to achieve their socio-economic goals. The statistics suggest a bleak future for many native Hawaiian youth with the State’s highest rates of teen pregnancy, school suspensions, incidents of substance abuse, and juvenile arrests. In addition, Wai‘anae is recognized as the most food insecure region of Hawai‘ with native Hawaiians having the highest rates of preventable disease including diabetes, heart disease and some cancers. Despite these statistics, Wai‘anae residents still maintain a rural vision, a willingness to perpetuate our community’s ‘country’ values and to offer hope and validation to our ‘opio of their personal and cultural identities. Their produce is being served in restaurants all over town. They can be found selling fresh harvest at the farmers markets listed below. They also operate a stellar CSA, for more info click here.